In an interview with Juan Carlos González Hernández, the Tourism Secretariat of Quintana Roo, he recently said that he trusted the Technical Commission of the federal Tourism Secretariat will act transparently when choosing the venue for the upcoming 2012 Tourist Tianguis (Marketplace). He said the best venue for the Tianguis was Quintana Roo. “I hope the Technical Commission will act with transparency and honesty because we are the best choice,” he said and added that Quintana Roo has more than 90,000 hotel rooms available. Furthermore, five of every 10 foreigners who arrive in Mexico by plane do so via Quintana Roo. Cancún has three convention centers that measure more than 10,000 square meters. The state’s infrastructure is at its peak condition, therefore, it would not be necessary to invest resources into improving it, González said. Quintana Roo has a lot of experience in organizing large national and international Tianguis conventions that have been a complete success. This shows that the state is more than capable of hosting the Tianguis next year. 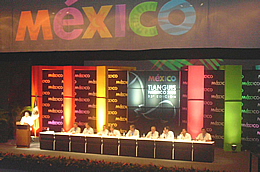 González said that one of the reasons why it was decided to hold the Tianguis somewhere other than Acapulco, was that Mexico needs to increase tourism-related sales and guarantee that exhibitors and buyers reach agreements that will benefit both parties and Quintana Roo’s tourist sector focuses on achieving this.